Eastern Wyoming College will honor veterans with a special celebration to be held on Tuesday, November 11, 2014 at 12:30 pm, in the Fine Arts Auditorium in Torrington, WY. The program is free and open to the public and will include guest speaker Major Justin L. Walworth, USAF, from Mitchell, NE. Major Walworth graduated from the Air Force Academy in 1999 and has served in the Air Force the last fifteen years. During that tenure he flew a tanker and refueled planes for Operation Enduring Freedom. He was also stationed in Hawaii and assigned as a pilot for Pacific Air Force One. Most recently Major Walworth was the Chief of Wing Safety at Lajes Field, Azores, Portugal. He is an experienced pilot with well over 100 missions completed. The program will also include the EWC Speech & Debate Team, EWC Choir and American Legion Travis Snow Post #5. EWC would like to honor all veterans and encourage all veterans and their families to attend this short program and hear Major Walworth’s remarks. Eastern Wyoming College Adult Basic Education (ABE) staff attended the State Adult Basic Education Institute annual meeting held in Casper, WY. The ABE program at EWC was presented with three state level awards in recognition of program excellence. The first award was for meeting federally negotiated program performance measures. Each year adult education programs are required to meet federally negotiated target performance levels. Because these target levels are set quite high, these targets can be quite difficult to meet. This year’s award marks the third consecutive year in which the ABE program at EWC has been the recipient of this state award. A second award was presented to Callie Allred for outstanding ABE instructor. The third award was presented to Diane McQueen, ABE Program Director, for Program Innovations. Diane is the state’s first recipient of this award from the Wyoming Community College Commission. “I’m very proud of our students, teachers, and of our program. We work hard to do the best we can for our students. I’m also very humbled by the award presented to me. It is an honor that I do not take lightly,” shared Diane McQueen. The Eastern Wyoming College Livestock Judging Team traveled to the Western Junior Stock Show (WJLS) in Rapid City, SD and then to Northern International Livestock Show (NILE) in Billings, MT. Matthew Johnson, freshman, Wheatland, WY showed a market pig and breeding ewe at WJLS. His pig was 2nd in its market class and Matthew was the Champion Senior Swine Showman. His breeding ewe was 4th in class. Although not on the judging team at EWC he also judged meats and livestock while there. Zeb Rosencranz, sophomore, Beulah, WY; Hadley Brown, freshman, Hyannis, NE; Danae McGarvin, freshman, Ten Sleep, WY; Emily Garl, freshman, Mitchell, NE; Taylor Russell, sophomore, Gering, NE; Paige Alyward, freshman, Dickins, NE; and Kiernen Brandt, freshman, Cheyenne, WY all went to NILE. These students exhibited two heifers and one steer in the club calve show and sale for Ty Steben of Torrington, WY. The students had been divided into teams with each team assigned a calf to prepare and exhibit. They were responsible for the daily feeding and care of the animals for the weeks leading up to the show. Then at the show each team fitted and exhibited their animal. The steer was then sold in the club calf sale. Also helping get these animals ready for the NILE were Shelby Cranston, freshman, Torrington, WY; Annie Butterfield, freshman, Worland, WY; Danielle Schainost, freshman, Yoder, WY; and Ashley Johnson, sophomore, Wheatland, WY. The team will be traveling to Arizona Nationals in December and National Western Stock Show in January. 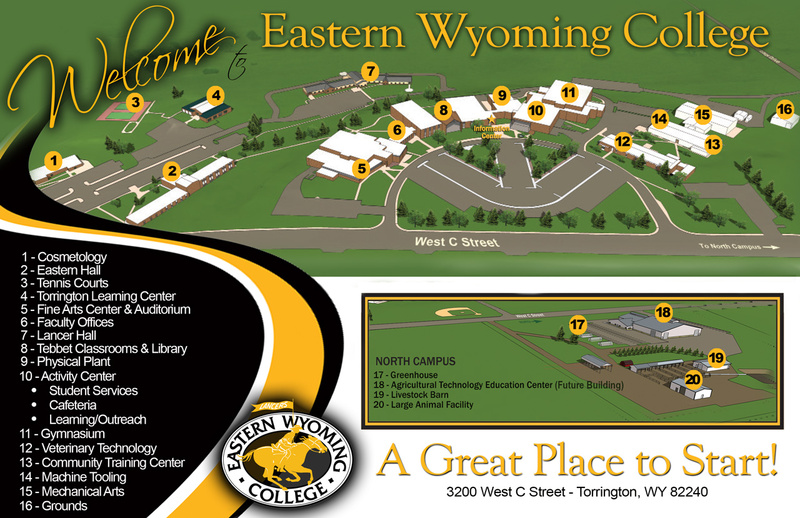 The Eastern Wyoming College Board of Trustees will hold a special board meeting on Friday, October 31, 2014 at 8:00 a.m. in the Dolores Kaufman Boardroom. The Community Education office at Eastern Wyoming College in Torrington announces a change in the December 7, 2014 dinner theatre trip. The trip has been changed to Irving Berlin’s classic “A White Christmas” at the Midtown Arts Center (Formerly the Carousel Theatre) in Fort Collins, CO. Tickets are still available at $65 which includes meal, non-alcoholic beverage and gratuity. Registration Deadline is December 1, 2014. The Eastern Wyoming Arts Council presents a Capella group Basix on Sunday November 16, 2014 at 2 pm in the Fine Arts Auditorium in Torrington, WY. Eastern Wyoming College is pleased to announce that thirteen students were initiated into the Phi Theta Kappa Honor Society on October 13, 2014. Students initiated into the Alpha Omicron Lambda Chapter of PTK include: Dylan Boltz, Lusk, WY; Alyce Bowman, Wheatland, WY; Shannon Brown, Douglas, WY; Shelby, Burroughs, Torrington, WY; Daxa Chaudhari, Douglas, WY; Kylie Christopherson, Laramie, WY; Stacey Cruth, Lingle, WY; Marni Hossfield, Newcastle, WY; Jamie Matthews, Douglas, WY; Kyle McDonald, Torrington, WY; Logan Soto, Glendo, WY; Devin Williams, Casper, WY; Blake Wisroth, Torrington, WY. Left to right back row: Blake Wisroth, Dylan Boltz, Alyce Bowman, Shannon Brown, Logan Soto. Left to Right front row: Stacey Cruth, Shelby Burroughs, Kylie Christopherson, Daxa Chaudhari, Jamie Matthews. The Community Education office at Eastern Wyoming College in Torrington has announced that the Gluten-Free Pasta & Dessert class will be held on Thursday, December 4 from 6 to 8:00 pm in the kitchen at the Rendezvous Center in Torrington. The cost for this class is $21. Going gluten free does not mean you have to give up your favorite pasta dish or dessert. Join Tiffanie Lofink in this hands-on class in which you will make a delicious gluten free dish or two while you learn a lot about gluten-free menu planning and how important it is to go beyond looking for “gluten-free” on the label. Bring lidded storage containers to take home your creations. Tiffanie and her family eat totally gluten free and still enjoy meal time. This is a great class for anyone concerned about gluten in their diet, whether it is due to celiac disease, gluten intolerance, or weight control.